EMAIL US TO SEE IF MOTOR MOUNTS ARE IN STOCK, MANUFACTURER IS TRYING TO KEEP UP WITH DEMAND. We have designed and produced a new motor mount for GM G-Body vehicles from '78-'87, replacing GM part numbers: 25504647 left and 1258718 right. These are more commonly referred to as "Poly Motor Mounts", because they have Polyurethane bushings incorporated into their design. These new mounts have proven to be indestructible and are stronger than even solid type mounts. 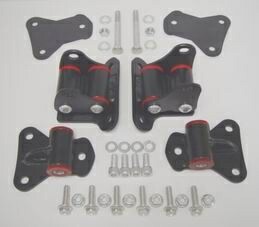 The Poly mounts are designed to benefit the every-day driver as well as the full time racer, at any performance level. The mounts now have a new design cross-pin being used in them. Previously the pin was round and would contact the frame pads once the engine was lowered into position determining the height of the engine. The new and improved pin design has a milled flat on one are which allows a and lowered height to be obtained on installation if needed. The pin can be rotated so the flat of the pin will contact the frame pad and drop the engine approximately 1/8" to 1/4". NOTE: We have THREE different designs for the above applications. The "1ST DESIGN" will ONLY fit Buick production 3.8's. For most street cars/daily drivers, upgrading the drivers side along with a GM passenger mount in very good condition will work fine. I do however always replacing both sides so your engine will sit level, replacing just the driver side while keeping a worn out original passenger side mount may lead to some downpipe clearance issues. For engines over approx. 500 HP, a pair is recommended for the best possible performance, as well as safety. If there is minimal clearance around the engine and excessive movement could cause problems, then a pair will also be much more helpful in keeping the motor in place. If an upgrade to a NON-Buick production 3.8 block is in your near future, it would be wise to consider our "second design" below. The second design is basically the same as the first design, they use the same grade of poly as the first design mounts but have added clearance machined into them for proper fit against the sides of the Stage 1 & 2 blocks. All styles of mounts are made from all new parts and materials, and assembled with precision CNC machined jig fixtures. To ensure the highest degree of quality, parts are laser cut and manufactured to precision tolerances with CNC equipment. They are welded with a state-of-the-art high frequency mig welder and include grade 8 (or better) hardware. A 3/8" hex bit driver for use on a ratchet will be needed to install while the motor is in the car. Our mounts are MUCH stronger than stock, without any of the problems associated with solid mounts. There are NO negative effects to the block or knock sensor from using our Poly mounts. They include the highest quality polyurethane bushings from a well known manufacturer that have been modified to be used with our design. They are soft enough to allow a slight amount of movement which reduces bind/stress, and also stiff enough to keep the engine where it is designed to be under full power. 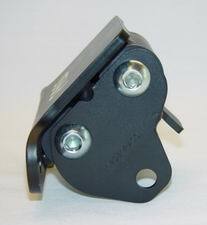 There is also added clearance over the stock mounts for aftermarket oiling systems, and they should NOT need any additional modifications. Testing with a 10.70's Buick GN in race trim has shown over 75% less flexing than the stock mounts at 5 psi boost (300-350 HP) brake torque. Another benefit we found was that the engine was shaking noticeably less at an idle. We also tested them at 30+ psi boost on many 1/4 mile passes, with 1.40 - 1.46 60 foot times, all without any engine anchor. This was with a production block and approx. 3500 Lbs car/driver. They have been low 9's on a customers car with a stage block using a transbrake, with no engine anchor or mid-plate. They are currently being used on many 9 sec cars, some 8 second cars and many milder daily drivers with great success. On an '87 Buick GN, the mounts can usually be changed with the motor still in the car somewhat easily, depending upon exact upgrades. They come fully assembled and have a black finish with new Allen head bolts (actually stronger than grade 8) and lock washers for bolting up to the block. 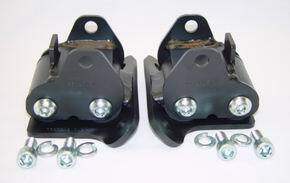 These have also been used to mount Turbo V-6's into several different non-Buick makes/models. Some fabrication of the frame pad and/or cross-members will obviously needed, depending upon applications. There will be a One Year limited warranty on the mounts against workmanship and/or breakage, limited to the replacement of the mount. Details will be included with each purchase, along with helpful tips for an easy installation. Because of the quality, design, and workmanship, the warranty applies even under extreme racing conditions. For more detailed information, please visit the other sections at the top of this page. These #HR-0121 Poly Motor Mounts are for the 89 TTA's with PRODUCTION 3.8 V-6s ONLY. They can also be used for engine swaps with prod. 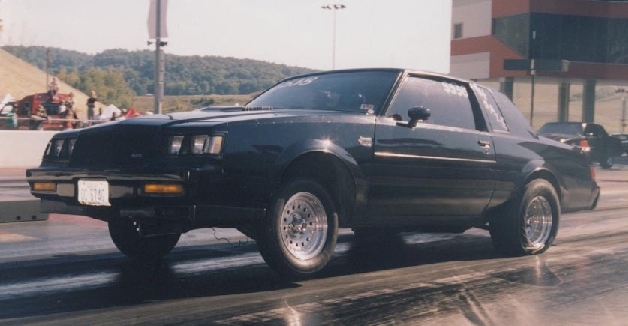 3.8's in other F-body chassis (Camaro/Firebird/Trans-Am). This is a COMPLETE KIT, including new motor mounts, new frame pedestals (frame pads), isolation pads, new hardware, and a custom wrench. These come with NEW softer custom poly bushings installed, designed especially for the TTA's. These are designed for daily driving and off road use, down to low 10's in the 1/4 mile, with great results. There will be a noticeable increase in vibrations felt inside the car due to the much stiffer and stronger design. They are designed to keep this to a minimum, but some comfort must be sacrificed for maximum strength and performance. These additional vibrations seem to be most common at idle in gear, and seem to diminish over 1000 rpm. This will vary from car to car, and between stock and rebuilt engines, and also reduces slightly as they "settle in". These are recommended for anyone with the factory 3.8 block, on the street and the track. The Motor Mounts come completely assembled and ready to bolt on, as do the frame pads, and they fit just as good as they look. These mounts greatly reduce engine movement, transfer power more quickly, and eliminate the need for an engine tie down strap. They are far more superior in strength than the stock mounts, making them virtually unbreakable. This design also increases the downpipe to frame clearance by approx 1/4", and make the motor sit level. 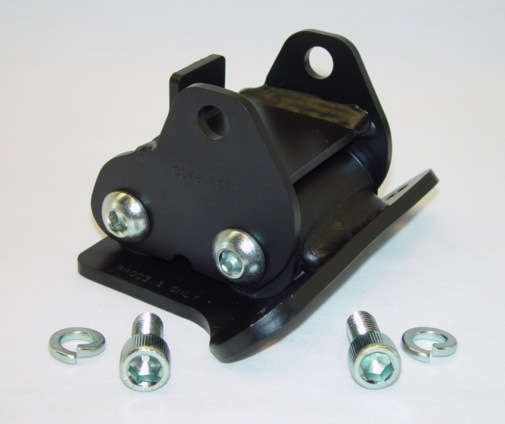 They come with a GM satin black finish, detailed installation instructions, our standard ONE YEAR limited warranty, and new plated grade 8 and 10.9 hardware to bolt up to the block, the crossmember, and for attaching the mounts to the frame pedestals. Also included are 2 special die-cut isolation pads for installation with the frame pads to help reduce any possible vibrations. Also included is a special custom wrench for the hard to reach nuts inside the crossmember.